This NYC Landmark at the corner of Fifth Avnue and 36th Street was constructed in 1905 for the Gorham Silverworks Company. It was designed by Stanford White in the Renaissance Florentine Palazzo style of architecture. 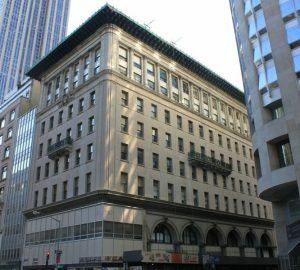 A 1960 alteration of the lower floors unfortunately destroyed the granite colonnade along Fifth Avenue and part of 36th Street facades. This was done prior to the establishment of the Landmark Preservation Commission ("LPC"). Since 2008, AK Architect has been the architect for the restoration and preservation of this important structure. Work includes cleaning and repairs to the exterior limestone facades as well as the replacement of the historic windows. We prevailed upon the LPC to allow for the replacement of the existing wood windows with aluminum windows, realizing substantial upfront and ongoing cost savings. AK Architect is currently designing the restoration of the lower level facade to the original utilizing modern replacement materials.